As for most people, I’m sure, with the new year comes new ideas, plans, projects and routines here at Rootfield. On the home front, I am feeling somewhat bereft with Mollie now at nursery three mornings a week; it is a culture shock for us both having been in each other’s company pretty much constantly for the past three years. So far, I have been distracting myself with exercise – my rusty 12-year-old mountain bike has had a few outings but desperately needs a service – as well as decluttering the house and completing my self-assessment tax return. Going forward, I plan to ready our one-bedroom granny flat in preparation to market it on Airbnb. Everyone I’ve mentioned this to over the festive period has responded positively, confident that it will be a popular let as well as the ideal part-time job for me. I’m certainly hoping our proximity to the popular North Coast 500 route will be a draw and the farm is well located for easy access to the west coast, the north and south with nearby Inverness and tourist-friendly Loch Ness beyond. In time, it would be lovely to be able to supply guests with my own handmade soap along with a breakfast hamper of fresh milk, yoghurt and eggs, but the soap curing period is almost four months so this is more of a medium-term project. Meanwhile on the farm, Nick has been doing some reconnaissance into milk vending with a visit to Forest Farm Organic Dairy at Kinellar, near Aberdeen, with lots of helpful advice from William and Angus Willis. The Willis brothers were the first to install milk vending machines in Scotland in 2017 when they transformed their old farm office into a shop, selling reusable glass bottles and pasteurised organic milk via a 200-litre capacity vending machine. The shop is attached to a wood-clad milking shed, complete with viewing window so customers can watch the 140-head Holstein-Friesian herd being milked at 3pm. Located just off a roundabout on the A96 going into Aberdeen, Forest Farm Dairy’s footfall clearly justified the significant initial investment of their vending machines. They’ve since added a second machine of 400-litre capacity to meet demand. William Willis visited Rootfield last summer to see our ice cream operation and, at the time, told Nick they were selling an average of 300 litres of milk a day. Nick estimates we are selling an average of 60 litres a day, between the honesty shop and our trade outlets, so if he goes ahead with vending, we would look to install a smaller capacity machine on the farm. For us, the cost of plastic bottles to the environment and the business has prompted us to seriously consider vending. Not only are we keen to improve our green credentials but there seems to be enough demand from our honesty shop customers to make the investment. Indeed, in and around our scattered rural community there is a thriving local food movement and a variety of initiatives promoting ways to reduce our carbon footprint, individually and collectively. The Dingwall Food Assembly, which I wrote about in a previous column – a European model whereby customers order and pay online for their food in advance then collect it from a central point – shut down at the end of last year because it was concluded nationwide that not enough food assemblies were flourishing in the UK. 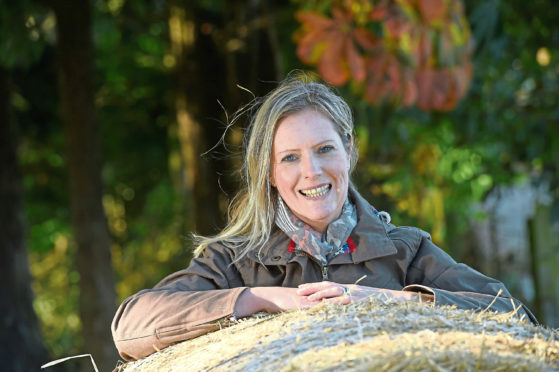 Undeterred, founder of community food company MOOFood, Emma Whitam – one of the original promoters of The Food Assembly, in conjunction with our local high school, Dingwall Academy – has relaunched the concept independently. The model is similar, with advance bookings and payment taken online then delivered to the school for collection. Now simply known as Dingwall Academy Market, the weekly event also features one or two stalls with tasters and products to buy on the day. Launched last week, it is a fantastic addition to the regular cycle of Saturday community markets held in the area. For more information see www.transitionblackisle.org. What’s more, the pupils at the academy are actively involved in the running of the market, enabling them to participate in a real business operating both online and in a physical marketplace. Further MOOFood-led local initiatives, with funding from Highland Council, include the planting of a community orchard last February, with fruit from a mix of 50 apple, pear, plum and cherry trees eagerly anticipated later this year; the installation of 25 growing boxes, to be planted with a variety of vegetables and salad and maintained by volunteers, and the recent arrival of a community fridge. All these inspirational initiatives are happening not far from here in the village of Muir of Ord, close to the Black Isle Showground. As stated on MOOFood’s website, their mission is to “inspire healthy, environmentally-friendly living and provide the community with the opportunity to reduce the carbon footprint, and enjoy healthy, affordable, chemical-free food”. I particularly like the ethos of the community fridge where folk (and commercial food businesses) can share surplus food that they no longer need or want by placing it in the centrally-located fridge. In-date items such as fruit and vegetables, bread, cakes, takeaway food from businesses or leftover food from meetings, tins and jars are all currently accepted. Open from 8am – 8pm, the fridge is free for anyone to use and looked after by the pupils of the village primary school during the week and volunteers at the weekend. It’s thought that the first community fridge originated in Germany in 2012, with a national network set up across England in the summer of 2017 by the environmental charity, Hubbub UK. MOOFood also runs workshops, events and classes following their founding principles. Inspiring stuff indeed – see www.moofood.org for more information – for the start of the year and something we hope to become a part of when we ditch the plastic and move into vending. Rootfield Farm is on the Black Isle, 10 miles north of Inverness, where Jo lives with husband Nick, a fourth-generation dairy farmer, their daughters Daisy and Mollie, and 170 cows.